Listen and let it penetrate your heart, my dear little son. Do not be troubled or weighed down with grief. Do not fear any illness or vexation, anxiety, or pain. Am I not here who am your Mother? Are you not under my shadow and protection? Am I not your fountain of life? Are you not in the folds of my mantle? In the crossing of my arms? Is there anything else you need? These are two blooms from the Our Lady of Guadalupe rose bush we planted in our front flower bed last April. The colder days we have had have not been able to compare with the warmer ones and right now, 60 degree days in combination with the rain have brought on a whole slew of new buds. 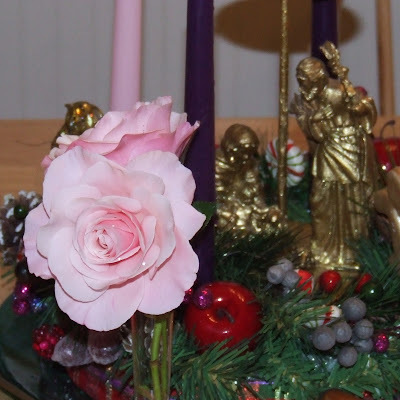 These two bloomed on December 9th, the feast of St. Juan Diego. I brought them inside on the 10th hoping that they would last until today. I can tell by their pallid complexion that they will not be gracing us with their beauty much longer. I am not sure if the ones still on the bush will get the chance to open, perhaps I should bring them in and try to force them. This rose bush has surprised us with its abundance time and time again. And now... roses in December. Maybe not a miracle, but they are divine! P.S. I am off to begin preparations for our Mexican fiesta tonight. What are your plans? That is one of the most beautiful roses I have seen, it's incredible! Matilda, that photo is BEAUTIFUL, I am so pleased to see that you have these two during the two feasts (Juan's and Our Lady's) wishing you a most blessed feast day! What a beautiful rose and beautiful picture! Oh, how neat is that!! Beautiful pic!